PPI dosing information. What have you heard about PPI dosing for babies? Did you know that because babies metabolize three times faster than most adults you more than likely will need to give higher doses, more frequently to control acid reflux? This is the basis of the MarciKids study done at the University of Missouri in the early 1990's. It was performed by a group of doctors that specialized in baby acid reflux. The creator and lead in that study was Jeffrey Phillips Pharm. D (Dr. P). Click on the video above so he can tell you about MarciKids himself. If you want to connect with Dr. P now for a FREE email consultation fill out this questionnaire. Tell your doctor about this PPI dosing information page. There's tons of medical literature supporting different approaches to PPI dosing (such as omeprazole, lansoprazole, esomeprazole) when treating acid reflux in babies and younger children when compared to older children (teens) and adults. This page explains how a child's age and weight, and the half-life (when the drug is most effective) and how using higher doses, more frequently in babies and younger children is more beneficial and the science behind it. Dr. P and Marcella Bothwell ENT along with other physicians and nurses worked on this study for over 12 years, helping families all over the nation desperate for help, long before internet was a primary resource for finding out information. MARCI KIDS' (Midwestern Acid Reflux Children’s Institute) primary focus was to provide PPI dosing information to medical professionals and to those caring for children with reflux. MarciKids is still a well known term for this dosing regimen. For your convenience we have a printable version in PDF form that contains a brief outline of the medical literature that support these treatment suggestions in addition to the doctors and researchers that are successfully applying these treatments. Or you can use this PDF outline of this webpage for your doctor as well. If you don't have a doctor or would like to hear options for treating your baby's reflux you can connect one of our on staff pediatricians now and learn more about PPI dosing information directly from a qualified doctor! PPI stands for proton pump inhibitor. PPIs block the production of acid at the parietal cell where production occurs. PPIs can only block the proton pumps that are active (producing acid at that moment). If the pumps aren’t producing acid then the PPI has no effect. Some products that might sound familiar are Nexium®, Prilosec®, Prevacid®, omeprazole and lanzoprasole. A Drug regimen is the drug that you take, how much you take per dose, and how often you take it. In addition the length of treatment is part of the regimen. For example, a common drug regimen for adult suffering from acid reflux disease could be Prevacid® (lansoprazole) 30mg twice per day. In this case the dose is 30mg and the dosage interval is twice per day. Half life is the time required for the drug concentration in the bloodstream to drop by ½. In many it is used to determine the dosage interval (number of doses per day) and is measured in minutes or hours. Volume of distribution relates to how the drug moves into the tissues of the body. It is sometimes used to determine the dosage. PPI Dosing Information - How Much Is Enough & Can You Give Too Much? Note that each of the listed PPI drugs below are currently approved by the FDA for pediatric use. That being said only Nexium is FDA approved in infants (for erosive esophagitis). PPI drugs have an effect on the production of acid. That effect is related to the amount of drug that is absorbed into the body. This amount of drug is measured as the AUC or Area Under the Curve. So, when your physician or medical care team are planning out a drug regimen with a PPI drug, the best thing to do is to try to achieve an AUC that is known to be enough of a dose to inhibit acid in twenty four hour and reduce damage and symptoms. In other words, you have to give enough quantity of the PPI drug and frequently enough to get the desired effect. Based on the MarciKids study when the dosing regimen of the PPI drug is insufficient your baby could continue to suffer from the symptoms of acid reflux disease. This could potentially be the cause of what is referred to by some moms as the acid battle. A common question is: Can I give too much to my baby? The short answer is NOT REALLY! PPI's are very specific in where they work in the body and are only active in a very specific place, the acid secreting portion of a cell called the parietal cell. Since PPI drugs only work on the acid secreting cell they have generally a good safety profile. PPI drugs are known as prodrugs because they are not active in the bloodstream. PPI's only become active when they pass into the acid secreting portion of the parietal cell (the cells in the stomach that make acid). This is important because, we get this question a lot. What ever the body does not put to use gets passed through the system with no effect. Tran A, Rey E, Pons G, Pariente-Khayat A, d'Athis P, Sallerin V, Dupont C. Pharmacokinetic-pharmacodynamic study of oral lansoprazole in children. Clinical Pharmacology and Therapeutics. 2002;71: 359-367. 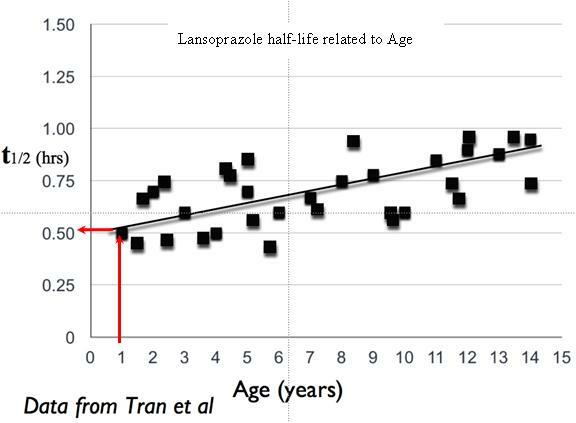 The graph above shows the half life of lansoprazole compared to age in infants and children. As you can see there is a relationship between age and half life with some degree of variability. This is important to consider because half life effects the AUC and as mentioned AUC has been correlated with acid inhibition in PPI medicines. Based on this process indicated on this PPI dosing information page, the estimated half-life for the child indicated here in the chart would be 0.5 hours. Published data indicates that the normal adult has half-life of 1.5 hours for lansoprazole. By dividing the adult half-life of 1.5 hours by this child's half-life of 0.5 hours (as indicated on the table above), we know this child would eliminate the lansoprazole three times faster then the adult. There is variation in the measurement of V.dist in most infants and as such this is an approximation. Some infants or children just require a higher dose to control acid reflux symptoms so there may be times when your doctor would want to increase the milligram (mg) per milliliter (mL) concentration and/or the dose. If an adult with GERD takes 1-2 dose per day, such as lansoprazole, to achieve symptoms of acid reflux control, it is plausible that an infant could need 2-3 doses per day. The MarciKids study showed that infants responded best to 2-3 doses a day. This is a reflection of the shorter half-life when compared to adults. It has been shown that infants have a larger Volume of distribution for PPI’s than adults. In general the volume of distribution is often related to the dose needed. The dose directly affects the area under AUC. There is variation in the measurement of V.dist in infants that's why this is an approximation. Some infants or children just require a higher dose to control acid reflux symptoms so there may be times when your medical care team would want to increase the milligram (mg) per milliliter (mL) concentration and/or the dose. Lansoprazole Lansoprazole (Prevacid®) is typically mixed at a 3mg per ml concentration. Omeprazole (Prilosec®, Zegerid® and generic forms) and Esomeprazole (Nexium®) All other PPI drugs (Nexium®, Prilosec®, Zegerid® as well as the generic versions of Omeprazole) are typically mixed at a 2mg per ml concentration. The MarciKids study started with two doses a day and if reflux wasn't controlled after 2 weeks then another dose was added. Your medical team will also discuss with you an important part of the treatment regimen which is the weaning or discontinuing PPI drugs all together. Your medical care team may want to start your infant with a lower dose and increase over time as needed. If your medical team decides to begin using a compounded suspension but not seeing improved symptom control from acid reflux disease a higher dose might be prescribed by your physician. As your new prescription will outline this will be accomplished by giving your baby a little more of the PPI suspension at each dosing time. If your baby is experiencing excess gas your physician may find it helpful to have the suspension compounded at a higher mg per ml concentration. As your physician may discuss with you it may take ten to fourteen days to see the results of a PPI treatment on the symptoms of infant GERD. Be patient, it can take time. This why your physician may want to stay at a specific dose for a period of time. Some Moms have commented that symptoms can get a little worse before they get better. Parents have referred to this as the acid battle. The acid in the stomach is very high in concentration when starting a proton pump inhibitor medication and a drug regimen. This of course is what's causing the infant acid reflux symptoms. It also causes the biggest difficulty when beginning your infants drug regimen. We get into great detail about this subject on "The Acid Battle" page. Your doctor may want to wean or titrate your baby up or down from PPIs and may find the information on the weaning page useful. This can assist in the process in making the dosing up process as smooth as possible. Please read about it here on the Weaning page. If you have any additional questions, please feel free to contact our Our Support Team. Burnett JE, Balkin ER. Stability and viscosity of a flavored omeprazole oral suspension for pediatric use. American Journal of Health-Systems Pharmacy 2006; 63:2240-2247. Gunasekaran TS, Efficacy and safety of omeprazole for severe gastroesophageal reflux in children. The Journal of Pediatrics 1993; 123:148-154. Israel D, Shepherd R, et al. Omeprazole for treatment of chronic erosive esophagitis in children: a multi-center study of efficacy, safety, tolerability and dose requirements. The Journal of Pediatrics 2000; 137:800-807. Iarocci TP, Tan H, Singer, J, Barron J, Pilzer E, Patel D, Bakst A. Proton pump inhibitors in infants. [Abstract] American Journal of Gastroenterology. 2005; 100(suppl.):S273. Andersson T, Lundborg P, et al. Pharmacokinetics of orally administered omeprazole in children. American Journal of Gastroenterology 2000; 95:3101-3106. Israel DM, Omeprazole and other proton pump inhibitors: pharmacology, efficacy, safety, with special reference to use in children. Journal of Pediatric Gastroenterology and Nutrition. 1998; 27:568-579. Specifically states that on a per kilogram (weight) basis, children require higher doses of omeprazole than adults due to different pharmacokinetics of omeprazole in children. Discusses at length the use of buffered PPI suspensions in children as a preferred dosage form. Litalien C, Theoret Y, Faure C. Pharmacokinetics of proton pump inhibitors in children. Clinical Pharmacokinetics 2005; 44:441-466. Phillips JO, Bettag ME, Parsons DS, Wilder B, Metzler MH. Use of flavored lansoprazole or omeprazole suspensions in pediatric GERD. [Abstract A1292] Gastroenterology 2000; 118: 5904. Phillips JO, Parsons DS, Fitts SW. Flavored lansoprazole suspension in pediatric GERD. [Abstract] Journal of Pediatric Gastroenterology and Nutrition 2000; 31:S181. [Abstract No. 707]. This PPI dosing information and chart and a portion of the textual contents of the PPI dosing information page came from the Marci-kids website.